I am not quite finished with my survey about “Education in a Modernizing Society.” For now I’ll turn to some conversations Ken and I had with Kazakh students this past weekend. Invariably, I ask young people about their grandparents and great grandparents, it seemed this group was not shy to tell us what they knew. One girl when challenged was able to name her ancestors seven back. She did so using her fingers to help remember where she was. She was applauded by her fellow English learners. Another fellow who seemed shy finally did talk about his grandparents but sad are those whose grandparents were orphaned during the Great Patriotic War. In this one case the grandfather’s name of his father was found out but that is rare. Another girl told of her grandparents being rich and able to go to Mecca but then when the collectivization started the grandfather buried all his treasure. Her relatives talk about how they sure could use the treasure now and speculate where it could be hidden. That led us down a discussion of getting into business of selling metal detectors and finding the spoils. The saying “Finders Keepers; Losers Weepers” came up and that had to be explained. One girl said she didn’t have any grandparents but she still had a 94 year old grand, grandfather. I thought and said “Wow, what a treasure.” She didn’t seem so happy about it because he lives in her home and constantly wants to do “remont” in their home. The only trouble is that he is nearly blind so we joked that if he were using a hammer and nails he might bang his fingers by trying to do reconstruction. She actually took my admonition seriously about sitting down with her great grandpa to ask him questions about the past. Maybe he wouldn’t be so eager to re-do their home if he had some attention paid to him. Another girl talked about her grandparents who had many children in the village and about how the grandfather repaired radios and other electronic things but never charged anyone anything. Her grandmother was a good seamstress. Yet another girl related that her grandfather had been in prison for 50 years, he was released at age 75 and had many more children after that. He got his name cleared of whatever he was guilty of. He had a wife before he was in prison and one afterwards, as I understood it. Seems the visits by the wife meant that she would go home pregnant. I think there were 14 in that family. Several students that talked about their grandmothers getting “Hero Mother” awards for having 10 children. In some cases the children may have died in infancy but it was encouraged back in the old days to have big families. One guy named Ruslan said that his grandfather was working in the mines near Karaganda and he LOVED to play cards. One day he lost his horse in a game and had to walk home. He later told me about a Russian documentary titled “Wait for Me” but for the life of me, I can’t remember what that is about. I think about the reuniting of families. Oy, that is why it is important to write things down right away. Finally, one girl who was part Tatar and Kazakh told of how her Tatar ancestors were from the Crimea region but were forcibly moved out by Stalin and some went on their own to Iran and then ended up in Uzbekistan. She said she had visited Ukraine to see where her roots had come from. She did say that her grandfather also fought in WWII and that he hated the Germans, he died in Berlin. So, there was an interesting mix of students that gathered at American Corner this past weekend. We will start up the films again and it was agreed that we would have tea and snacks before that and discussion of the film afterwards. 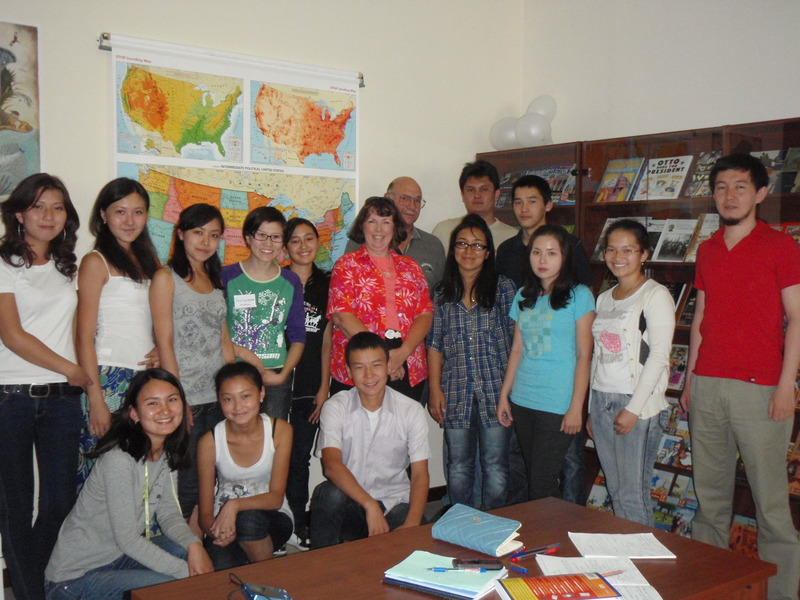 Meeting these Kazakh students is one of the perks of living in Kazakhstan.